Lackawanna’s Polonia is older than the city itself. Poles began living in what would become the city of Lackawanna in the late 1800s. Drawn first by the railroads and later by the steel plant, the Poles had a sizeable population by the turn of the century. As they had a hundred times before across America, the collection of Poles formed a Roman Catholic church and the community truly got under way. The mother church of Lackawanna’s Polonia, St. Barbara’s was established in 1903 when 250 Polish families requested a parish for themselves in the western end of the town of West Seneca. Father Peter Szulc was assigned to the new parish and within two years the combination church and school house were built. In 1909 when Lackawanna was incorporated as a city, the parish was a thriving and dynamic place. 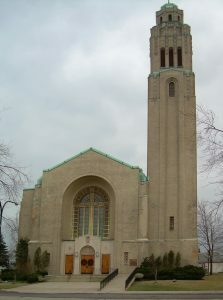 The parish continued to grow and in 1929, Joseph E. Fronczak was hired to design a new church for St. Barbara’s locating it on Ridge Road. The young architect came up with a distinctly modern church inspired by the Art Deco movement that included a 150-foot brick tower. Artist Joseph Mazur was hired to decorate the interior and craft the stained glass windows. When the building was completed, it along with the basilica became the dominant feature of the city skyline. St. Barbara’s would in turn give birth to two other Roman Catholic churches in the city, St. Hyacinth’s and St. Michael the Archangel. St. Hyacinth’s was formed in 1910 in Lackawanna’s First Ward. Poles began settling in that part of the city due to the low priced housing Lackawanna Steel was offering. St. Michael the Archangel parish in the southern section of the city was formed in 1921 because of the great distance families had to travel for school and Mass at St. Barbara. A Polish National Catholic Church, Holy Trinity was also formed in Lackawanna. Unlike Buffalo, where Holy Mother of the Rosary was formed out of a schism at St. Adalbert’s, Holy Trinity was established by Polish Nationals that moved from Scranton, PA to Lackawanna as part of Lackawanna Steel. With a bustling neighborhood, a community center was soon needed. On October 19, 1919 with a party and parade, the Lackawanna Dom Polski was opened. Located near St. Hyacinth’s church the two-story brick Dom Polski offered a large meeting hall, theater, reading room, and offices. The hall would see many dances, rallies, and meetings over the years. Lackawanna has produced a number of prominent Polish personalities and events of merit. Lackawanna has the distinction of being the first city to elect a Polish American to the office of mayor, with the 1923 victory of Walter Lohr. Later Lohr would become president of the Polish Union of America, an office later held by fellow Lackawannan Daniel Kij. The city also produced a world-renowned Polish American sculptor and activist Louis F. Dlugosz. An outsider artist, Dlugosz created a “pretzel-bending” sculptural style using Lackawanna clay. His works are held by the Museum of Modern Art, Smith College Museum, Royal Ontario Museum, and numerous private collections. 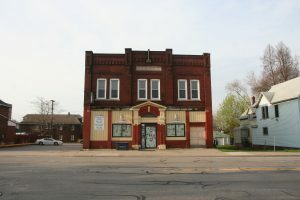 Following the closing of the steel plant and the loss of other industries, Lackawanna and its Polish community declined. The Dom Polski and St. Hyacinth’s Church were closed, while, St. Barbara’s Church was closed and razed. The two other Polish churches remain open but Holy Trinity Polish National Catholic Church has moved to Woodlawn, New York and St. Michael’s Roman Catholic Church has been renamed Queen of Angels. Bisco, Jim. "Steelworker Sculptor." Western New York Heritage Fall (2005): n. pag. Print. "Crowds Inspect New Dom Polski." Buffalo Courier [Buffalo, NY] 29 Sept. 1919: n. pag. Print. The History of Lackawanna. Lackawanna, NY: Published as an Activity of the Lackawanna Bicentennial Commission, 1977. Print. Kij, Daniel. "Lackawanna's Pol-Am Connections." The Am-Pol Eagle. N.p., n.d. Web. 16 Jan. 2016. "Louis F. Dlugosz." The Monuments Men | Official Site. N.p., n.d. Web. 16 Jan. 2016. Pamietnik Instalacyjny Bankiet Ku Czci Wiel. Ks. Jan Hrycyna. Lackawanna, NY: Paraffi Sw. Jacka, 1948. Print. Pamietnik Zlotego Jubileuszu Parafii Sw. Barbary, 1903-1953. Lackawanna, NY: n.p., 1953. Print. Saint Michael the Archangel Church 1921 1996. Lackawanna, NY: n.p., 1996. Print. Szemraj, Edward R., Wanda M. Slawinska, Robert Farkas, and Mary Joanne. Suranni. The Polonian Legacy of Western New York: Stories of the Lives, Accomplishments, and Contributions of Four Prominent Polish-Americans. Buffalo, NY: Canisius College, 2005. Print.